Glucose-dependent insulinotropic polypeptide (GIP) is a peptide hormone released from gut K cells. While the predominant form is GIP(1–42), a shorter form, GIP(1–30), is produced by pancreatic alpha cells and promotes insulin secretion in a paracrine manner. Here, we elucidated whether GIP(1–30) expression is modulated in mouse models of diabetes. We then investigated whether PEGylated GIP(1–30) can improve islet function and morphology as well as suppress the progression to hyperglycaemia in mice treated with low-dose streptozotocin (LD-STZ). We examined pancreatic GIP immunoreactivity in rodent diabetic models. We synthesised [d-Ala2]GIP(1–30) and modified the C-terminus with polyethylene glycol (PEG) to produce a dipeptidyl peptidase-4 (DPP-4)-resistant long-acting GIP analogue, [d-Ala2]GIP(1–30)-PEG. We performed i.p.GTT and immunohistochemical analysis in non-diabetic and LD-STZ diabetic mice, with or without administration of [d-Ala2]GIP(1–30)-PEG. Pancreatic GIP expression was concomitantly enhanced with alpha cell expansion in rodent models of diabetes. Treatment with DPP-4 inhibitor decreased both the GIP- and glucagon-positive areas and preserved the insulin-positive area in LD-STZ diabetic mice. Body weight was not affected by [d-Ala2]GIP(1–30)-PEG in LD-STZ or non-diabetic mice. Treatment with GIP significantly ameliorated chronic hyperglycaemia and improved glucose excursions in LD-STZ mice. Treatment with GIP also reduced alpha cell expansion in the islets and suppressed plasma glucagon levels compared with non-treated LD-STZ mice. Additionally, [d-Ala2]GIP(1–30)-PEG preserved beta cell area via inhibition of apoptosis in LD-STZ mice. Our data suggest that GIP(1–30) expression is upregulated in diabetes, and PEGylated GIP(1–30) can suppress the progression to STZ-induced hyperglycaemia by inhibiting beta cell apoptosis and alpha cell expansion. The online version of this article (doi: 10.1007/s00125-015-3842-y) contains peer-reviewed but unedited supplementary material, which is available to authorised users. Glucose-dependent insulinotropic polypeptide (GIP) is an incretin hormone, released from the gut endocrine K cells, that promotes insulin secretion from pancreatic beta cells in a glucose-dependent manner. After secretion, GIP is rapidly inactivated by dipeptidyl peptidase-4 (DPP-4) by cleavage into truncated forms that are no longer insulinotropic [1, 2, 3, 4, 5, 6]. The polypeptide was originally discovered as a 42 amino acid peptide [7, 8, 9] and pro-GIP is processed to GIP(1–42) by prohormone convertase (PC) 1/3 co-localised in the gut K cells . Glucagon-like peptide 1 (GLP-1) and GIP are occasionally found in the same cells (so-called K/L or L/K cells); thus pro-GIP is presumably partially co-expressed with GLP-1 in the gut . An antibody specific to the C-terminus of GIP(1–42) failed to detect GIP immunoreactivity in the pancreas . However, Gip mRNA expression was confirmed by RT-PCR and in situ hybridisation in the periphery of pancreatic islets in mice . Moreover, pancreatic GIP immunoreactivity can be found in alpha cells of mouse, human and python using a GIP antibody recognising the mid-portion of GIP(1–42) . The pro-GIP molecule appears to be processed to short-form GIP(1–30) in pancreatic alpha cells via PC2 . The short-form GIP(1–30) possesses insulinotropic activity similar to GIP(1–42) ex vivo . Dipeptidyl peptidase-4 inhibitors and GLP-1 analogues are new classes of glucose-lowering treatment widely accepted to improve glycaemic control in patients with type 2 diabetes mellitus. In contrast, it is unclear whether GIP analogues are useful therapies for diabetes because GIP is largely considered to induce obesity. The GIP receptor (GIPR) is expressed in pancreatic beta cells, bone, central nervous system and adipose tissues [13, 14]. One of the extrapancreatic actions proposed for GIP is the promotion of fat deposition in adipocytes [13, 14, 15, 16]. Indeed, genetic ablation of GIPR and GIPR blockage by GIPR antagonist or GIP neutralising antibody can protect mice from diet-induced obesity and improve glucose tolerance [17, 18, 19, 20, 21]. Conversely, recent studies have shown that GIP overexpression in transgenic mice or administration of a GIPR agonist to diabetic rodents ameliorates glycaemic control and insulin secretion, and these effects are accompanied by suppression of beta cell apoptosis without increases in body weight or food intake [22, 23]. Currently, it is unclear whether pancreatic GIP(1–30) expression is altered in diabetic conditions. Therefore, we first investigated whether GIP(1–30) expression is modulated in models of diabetes and could be influenced by treatment with a glucose-lowering agent. To elucidate the therapeutic potential of GIP(1–30), we synthesised a long-acting GIP(1–30) analogue. We conducted a study to assess whether the GIP analogue could suppress the progression to hyperglycaemia and improve glucose tolerance in STZ-induced diabetic mice. We also examined whether the short-form GIP(1–30) analogue could improve islet function and morphology in this model. In addition, we examined whether the GIP analogue promotes increased weight gain in mice fed a high-fat diet (HFD). Six-week-old male C57BL/6 mice were purchased from CLEA Japan (Tokyo, Japan) and housed under a 12 h light/dark cycle with free access to food and water. All procedures were performed in accordance with Asahikawa Medical University guidelines for the use of animals, with the approval of the university animal research committee. In the HFD feeding study, we used a commercial diet consisting of 60% energy from fat, 20% from protein and 20% from carbohydrate (D12492, Research Diets, New Brunswick, NJ, USA). We synthesised a DPP-4-resistant human GIP(1–30) analogue. The N-terminal alanine in position 2 was replaced with a d-alanine (d-Ala2) to confer DPP-4 resistance ([d-Ala2]GIP[1–30]). The C-terminal end was modified with 40 kDa polyethylene glycol (PEG) ([d-Ala2]GIP[1–30]-PEG). The purity of [d-Ala2]GIP(1–30) and [d-Ala2]GIP(1–30)-PEG was determined by HPLC to be 98.2% and 95.7%, respectively, and the molecular mass was confirmed by MALDI-MS (Peptide Institute, Osaka, Japan). We used HEK293 cell lines stably co-transfected with human forms of GIPR or glucagon receptor, and a cyclic AMP-inducible luciferase expression construct. The HEK293 cell lines were cultured in DMEM (25 mmol/l glucose) with 10% (vol./vol.) FBS (Gibco, Tokyo, Japan), 100 U/ml penicillin and 100 μg/ml streptomycin (Invitrogen, Tokyo, Japan) at 37°C in 5% CO2. We incubated the cells overnight in 96-well plates (100,000 cells per well). The next day, we replaced media with samples or synthetic peptide standards (GIP[1–42]: 10−13 to 10−7 mol/l, glucagon: 10−13 to 10−10 mol/l) diluted in KRB (pH 7.4) containing 0.5% (wt/vol.) BSA (Sigma-Aldrich, Tokyo, Japan) and incubated for 5 h at 37°C in 5% CO2. After incubation, we measured luciferase activity with the Bright-Glo Assay Kit (Promega, Madison, WI, USA) using a Thermo Scientific Appliskan (Thermo Fisher Scientific, Waltham, MA, USA) according to the manufacturer’s instructions, and calculated the hormone concentrations as previously described [12, 24]. We divided mice into four groups: non-STZ; non-STZ + GIP; STZ; and STZ + GIP. We injected STZ (50 mg/kg; Sigma Chemical, St Louis, MO, USA) dissolved in sodium citrate buffer or vehicle i.p. on days 1–5. We injected [d-Ala2]GIP(1–30)-PEG s.c. every 3 days (initial dose 100 pmol/animal and maintenance dose 70 pmol/animal) from day 1 of STZ injection. We chose the injection doses of [d-Ala2]GIP(1–30)-PEG based on our previous results  and current observations (see electronic supplementary material [ESM] Methods and ESM Fig. 1). In the group receiving DPP-4 inhibitor intervention, mice were treated with des-F-sitagliptin (provided by Merck, Kenilworth, NJ, USA) 2 weeks prior to LD-STZ treatment, as described previously . Non-fasted blood was collected from the tail vein, and blood glucose levels were measured with a Onetouch Ultra glucometer (Lifescan Japan, Tokyo, Japan) every 3 days until day 30. Body weight was determined at the time of glucose measurement. Levels of HbA1c were measured using a DCA Vantage Analyzer (Siemens, Munich, Germany) in blood collected from the tail vein on day 33. We performed an i.p.GTT on day 34. Mice were fasted for 16–18 h before the i.p.GTT. Blood glucose levels were measured at 0, 10, 20, 30, 60 and 120 min after a glucose load (2 g/kg body weight). For plasma insulin and glucagon determinations, blood samples from the tail vein were collected into heparinised tubes at 0 and 10 min. The blood samples collected were mixed with a 10% volume of cooled NaCl (154 mmol/l) solution containing 12.5 mg/ml EDTA-2Na, 5,000 U/ml aprotinin and 1% (vol./vol.) DPP-4 inhibitor (Millipore, Billerica, MA, USA). These samples were separated by centrifugation at 4°C and stored at −80°C until assay. Plasma insulin levels were measured using a mouse insulin ELISA kit (Morinaga Institute of Biological Science, Yokohama, Japan) according to the instructions. Plasma glucagon levels were determined via cell-based, receptor-mediated bioassay as described above. This glucagon assay does not cross-react with at least up to 10−8 mol/l of either GIP or GLP-1 (ESM Fig. 2). Pancreases were resected immediately after the mice were killed on day 35, and fixed in 4% (wt/vol.) paraformaldehyde overnight at 4°C. Further procedures were performed as described elsewhere  and the antibodies used are described in ESM Methods. Stained sections were observed using an all-in-one fluorescence microscopy system (BZ-8100; Keyence, Osaka, Japan), and digital images were collected. We measured the insulin- and glucagon-positive cell areas using commercial software (BZ Analyzer; Keyence, Osaka, Japan), and assigned these as beta cell area and alpha cell area, respectively. We also counted the number of insulin-positive cells according to DAPI (nuclear) staining, and estimated islet area from the beta and alpha cell staining and DAPI staining. All morphometry studies were conducted in a blinded fashion. Insulin- and PCNA-double-positive cells were assigned as beta cell proliferation. Apoptotic beta cells were determined by TUNEL-positive staining and adjusted for beta cell area in serial sections stained with insulin. A commercial apoptotic cell detection kit (In Situ Cell Death Detection Kit, TMR Red; Roche Diagnostics Japan, Tokyo, Japan) was used for TUNEL staining. Mice were treated with [d-Ala2]GIP(1–30)-PEG or PBS as in the LD-STZ study. Non-fasted blood glucose and body weight were monitored up to day 30. We measured HbA1c levels at day 33. Data are expressed as mean ± SEM. Statistical analysis was performed using the unpaired Student’s t test, one-way ANOVA followed by Tukey post hoc test or two-way repeated ANOVA followed by the Bonferroni post hoc test. Data were analysed using commercial software (Prism 5; GraphPad, San Diego, CA, USA). A value of p < 0.05 was considered significant. To detect pancreatic GIP, we used a GIP antibody that recognises the mid-portion of GIP. In previous studies, it was reported that this antibody can detect both GIP(1–42) and GIP(1–30), while an antibody specific to the C-terminus of GIP reacted only with GIP(1–42) and did not label any cells in islets of wild-type animals [10, 12]. Therefore, we chose the antibody capable of recognising GIP(1–30) for our current studies. We observed that pancreatic GIP immunoreactivity was enhanced concomitantly with alpha cell expansion and decreased beta cell area in rodent models of type 1 and type 2 diabetes, including NOD, db/db, Akita and LD-STZ (Fig. 1). In LD-STZ mice, the GIP-positive area per islet increased 3.6-fold compared with non-diabetic controls (p < 0.05; Fig. 2a, ESM Fig. 3). Pharmacological intervention via DPP-4 inhibition significantly decreased the GIP-positive area and ameliorated alpha cell expansion as well as preserving beta cell area in LD-STZ mice (Fig. 2a–c, ESM Fig. 3). We synthesised [d-Ala2]GIP(1–30)-PEG to investigate the therapeutic potential of short-form GIP. Luciferase activity was increased by GIP(1–42), GIP(1–30) and synthetic GIP analogues in HEK293 cells stably co-transfected with GIPR and a cAMP-inducible luciferase expression construct in a concentration-dependent manner (ESM Fig. 4). Almost equivalent luciferase activity was produced by GIP(1–42) and GIP(1–30), indicative of comparable activation of the GIPR by these two forms of GIP. In contrast, [d-Ala2]GIP(1–30) and [d-Ala2]GIP(1–30)-PEG induced lower luciferase activity than GIP(1–42) or GIP(1–30) (ESM Fig. 4). Next, to assess glucose-lowering actions and the circulating kinetics of [d-Ala2]GIP(1–30), we conducted i.p.GTTs in normal mice given various s.c. doses of [d-Ala2]GIP(1–30) (7,000 pmol/animal, 1,400 pmol/animal, 350 pmol/animal) or vehicle (PBS). Treatment with GIP lowered glucose excursions during i.p.GTTs, even at the minimum dose (ESM Fig. 5a). The peak plasma concentration of [d-Ala2]GIP(1–30) appeared at 1 h after administration and was approximately 80 pmol/l, equivalent to levels following injection of 350 pmol/animal GIP(1–42). We did not detect any activity of GIP at 4 h after administration (ESM Fig. 5b). To further evaluate the pharmacokinetics of the peptides, we performed single s.c. injections of [d-Ala2]GIP(1–30) or [d-Ala2]GIP(1–30)-PEG in normal mice at 7,000 pmol/animal and collected blood samples at 1 h to 7 days after the injection. After a single administration, [d-Ala2]GIP(1–30) had rapidly increased by 1 h, but disappeared from the blood within 24 h. In contrast, [d-Ala2]GIP(1–30)-PEG was cleared very slowly from plasma, with an estimated half-life of approximately 60 h. Furthermore, [d-Ala2]GIP(1–30)-PEG was still detectable in the blood at day 7 when we injected 7,000 pmol/animal (ESM Fig. 5c). In the intervention study, chronic GIP treatment did not affect body weight in STZ or non-STZ mice (Fig. 3a), or food intake (STZ vs STZ + GIP, 3.8 ± 0.1 g/day; 3.7 ± 0.1 g/day). In contrast, [d-Ala2]GIP(1–30)-PEG treatment significantly ameliorated non-fasted blood glucose levels in LD-STZ mice at days 27 and 30 (STZ + GIP vs STZ, p < 0.05; Fig. 3b). Treatment with GIP treatment also reduced HbA1c levels at day 33 in LD-STZ mice (STZ + GIP 4.9 ± 0.2% (29.7 ± 2.3 mmol/l) vs STZ 5.7 ± 0.4% (38.5 ± 4.3 mmol/l), p < 0.05; Fig. 3c). During i.p.GTTs, chronic GIP treatment did not alter the glucose excursion in non-diabetic mice, but improved glucose tolerance in LD-STZ mice. The AUC during i.p.GTTs was also significantly decreased by [d-Ala2]GIP(1–30)-PEG in STZ mice (AUC: STZ + GIP 2,465 ± 114 vs STZ 2,961 ± 166 mmol/l × min, p < 0.05; Fig. 3d, e) in association with suppressed plasma glucagon levels and increased plasma insulin levels (Fig. 4a–d). To evaluate the effect of [d-Ala2]GIP(1–30)-PEG treatment on the islet architecture, we examined insulin and glucagon double immunofluorescence staining in the pancreas (Fig. 5a). In non-treated STZ mice, the beta cell area was decreased by about 40% and the alpha cell area was increased 4.2-fold compared with non-STZ mice. However, in GIP-treated STZ mice, the beta cell area was increased 1.47-fold and the alpha cell area was decreased by 48% compared with STZ mice (STZ + GIP vs STZ, p < 0.05; Fig. 5b, c). In GIP-treated STZ mice the insulin/glucagon ratio was 2.1-fold higher than in non-treated LD-STZ mice (STZ + GIP vs STZ, p < 0.05; Fig. 5d). Therefore, [d-Ala2]GIP(1–30)-PEG treatment partially restored islet morphology in LD-STZ mice. We observed that GIP treatment partially suppressed the reduction in beta cell area in LD-STZ mice, so we next assessed whether beta cell apoptosis and/or proliferation contributed to the morphological changes. With respect to beta cell apoptosis, TUNEL-positive beta cells were significantly increased in non-treated STZ mice (Fig. 6a), while GIP treatment significantly reduced the number of TUNEL/insulin-double-positive cells in LD-STZ mice (Fig. 6b). There were no significant differences in the proliferation of beta cells between GIP-treated and non-treated LD-STZ mice assessed by the number of PCNA/insulin-double-positive cells (Fig. 6c). In addition, 8-OHdG immunostaining was not different between the groups, suggesting that oxidative stress was not involved in the reduction of beta cell area (ESM Fig. 6). We examined whether the GIP analogue might promote excessive weight gain and thereby exacerbate glucose intolerance in HFD-fed mice. In the HFD feeding study, chronic GIP treatment did not affect non-fasted glycaemia (data not shown) or HbA1c levels at day 33 (Fig. 7a). Interestingly, chronic GIP treatment significantly suppressed body weight gain in HFD mice compared with the non-treated group (Fig. 7b). In the current study, we observed that pancreatic GIP expression was enhanced with alpha cell expansion in various diabetic rodent models. It was previously demonstrated that the transcription factor paired box 6 (PAX6) induces pro-GIP and proglucagon promoter activity . Therefore, it is possible that PAX6 is upregulated in diabetes and thereby increases transcription of the two genes, resulting in enhanced GIP(1–30) and glucagon expression. We previously observed that alpha cell area was increased with enhanced alpha cell proliferation . Therefore, both increased cell number and GIP content per cell might contribute to our observation. Despite the increase in islet GIP expression in the diabetic setting, the insulinotropic effect of GIP may be diminished [25, 26], perhaps because GIPR expression in beta cells is reduced in the hyperglycaemic state [27, 28]. We speculate that pancreatic GIP expression may be upregulated to compensate for reduced GIP signalling in beta cells in diabetic animals. Additionally, GIPR signalling in beta cells is believed to be important to maintain islet architecture. Mice with Gipr knockout have abnormal islet structure [29, 30] and GIP is expressed in alpha cells and beta cells of human fetal islets . Therefore, increased expression of pancreatic GIP may contribute to maintaining and protecting beta cells against various challenges in diabetes. With regard to the therapeutic potential of short-form GIP(1–30), the GIP analogue successfully ameliorated chronic hyperglycaemia in LD-STZ mice. Frequent injections of GIP(1–30) also improved beta cell mass and function together with glucose tolerance in Zucker diabetic fatty (ZDF) rats . The GIP(1–42) and GIP(1–30) forms are rapidly cleaved in the circulation by DPP-4 . While [D-Ala2]GIP(1–30) is DPP-4 resistant, it is not sufficiently long acting, as GIP activity disappeared within 4 h after a single administration in vivo. In contrast, [d-Ala2]GIP(1–30)-PEG activity was still detectable on day 7 after administration, illustrating the advantage of the PEG moiety in permitting maintenance of an effective plasma concentration with infrequent administration. Notably, in [d-Ala2]GIP(1–30)-PEG-treated LD-STZ mice, glucagon secretion was significantly suppressed both before and after a glucose load. However, GIP has been reported to increase glucagon release in both rodents and humans [32, 33], but may do so only at low glucose levels [32, 34]. The effect of [d-Ala2]GIP(1–30)-PEG on glucagon secretion might be modulated by GIPR downregulation in alpha cells. Nevertheless, while we are not aware of reports of alpha cell desensitisation to GIP, we cannot discount the possibility that this occurred, thereby alleviating the glucagonotropic action of GIP. Here, we administrated a GIP(1–30) analogue rather than GIP(1–42), and it is possible that GIP(1–30) acts differently from GIP(1–42) on glucagon secretion from alpha cells. However, our preliminary data suggest that [d-Ala2]GIP(1–30)-PEG enhances glucagon release from rat isolated islets at low (3 mmol/l) glucose (data not shown). Consistent with our in vivo findings, we have previously reported that pharmaceutical intervention via a DPP-4 inhibitor that boosts active GIP and GLP-1 levels can also suppress glucagon secretion, in addition to alpha cell proliferation, in LD-STZ mice . We speculate that exogenous GIP administration might indirectly suppress fasting glucagon secretion through enhanced basal insulin release. We have previously observed that treatment with a DPP-4 inhibitor suppresses beta cell apoptosis in LD-STZ mice . By inhibiting apoptosis, GIP reportedly has a protective effect on pancreatic beta cells [22, 23]. In our histological analysis, [d-Ala2]GIP(1–30)-PEG treatment suppressed both the loss of beta cells and expansion of alpha cells in LD-STZ mice. Treatment with GIP significantly decreased TUNEL-positive beta cells but did not increase PCNA-positive beta cells in LD-STZ mice. These results suggest that GIP(1–30) has the potential for conferring beta cell protection rather than proliferation. The mechanisms by which GIP inhibits islet beta cell apoptosis appear to involve decreasing the expression of the pro-apoptotic Bax gene and increasing expression of the anti-apoptotic Bcl2 gene [23, 34, 35, 36]. It is possible that GIP expression in islets may be enhanced to block several apoptotic factors in diabetes. Despite the restoration of beta cell area in LD-STZ mice to almost that of control mice following [d-Ala2]GIP(1–30)-PEG treatment, insulin levels were elevated only in the fasting state, compared with non-treated LD-STZ mice. We have observed similar results with LD-STZ mice treated with DPP-4 inhibitor, whereby beta cell numbers were similar to non-STZ controls, yet the treatment only partially improved the glucose excursion during an OGTT . Therefore, restoration of beta cell mass is not necessarily sufficient to normalise insulin output and glycaemia. While in control mice, acute treatment improved glucose tolerance (ESM Fig. 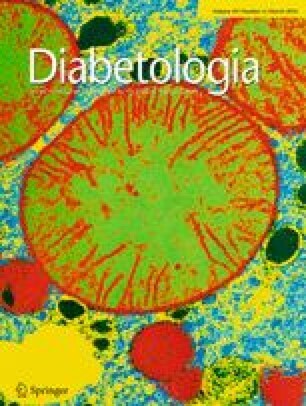 5a), chronic treatment with [d-Ala2]GIP(1–30)-PEG had no effect on glucose tolerance and insulin secretion (Fig. 4). Widenmaier et al also reported that [d-Ala2]GIP(1–30) can acutely induce insulin secretion . Chronic treatment may induce downregulation of GIP receptor expression and/or desensitisation of downstream signalling pathways, such that the enhancement of insulin secretion is not maintained; this would thereby limit the long-term effect on glucose tolerance. However, it is notable that heterozygous mice with zinc-inducible overexpression of GIP (Tg-GIP) maintained GIP sensitivity and displayed improved glucose tolerance, along with increased postprandial insulin secretion, preserved beta cell area and reduced beta cell apoptosis . In contrast, zinc-treated homozygous Tg-GIP mice with even greater overexpression of GIP (approximately four fold higher plasma GIP levels than in zinc-treated heterozygous mice) developed GIP resistance . Thus, the ability of exogenous PEG-GIP to have sustained insulinotropic effects without inducing GIP resistance is likely to be concentration dependent and further studies will be required to determine the optimal PEG–GIP dosing. The GIP(1–30) and GIP(1–42) forms display approximately equivalent insulinotropic action [12, 23, 37, 38] and anti-apoptotic effects on pancreatic beta cells [23, 34, 35, 36]. In contrast to pancreatic actions, the two isoforms may show dissimilar effects on extrapancreatic tissues. For example, in 3T3-L1 adipocytes, [d-Ala2]GIP(1–30) induces significantly lower lipoprotein lipase (LPL) activity than [d-Ala2]GIP(1–42) . Our study also suggests that the GIP(1–30) analogue does not induce fat accumulation and body weight gain, possibly because of the limited action of GIP(1–30) on adipose tissue. It has been proposed that simultaneous targeting of GIP, GLP-1 and glucagon receptors may be beneficial in the treatment of obesity and metabolic disorders . Indeed, administration of a tri-agonist improved glucose intolerance in rodents . Additionally, body weight, food intake, fat mass, plasma cholesterol and hepatic lipid accumulation were reduced in mice fed a high-sucrose diet . Interestingly, the tri-agonist reduced body weight more intensively than liraglutide alone or a GLP-1/glucagon co-agonist, suggesting that agonistic action of GIP may not promote weight gain, but rather weight loss. In conclusion, our data suggest that expression of pancreatic GIP, likely GIP(1–30), is upregulated in diabetes and PEGylated GIP(1–30) can suppress the progression to STZ-induced hyperglycaemia by inhibiting beta cell apoptosis and alpha cell expansion. Therefore, GIP(1–30) may play an important role in glucose metabolism, and further studies are warranted to explore the therapeutic potential of this peptide. We sincerely thank S. Covey (University of British Columbia, Canada) for proofreading. This research was supported in part by a research grant from Merck Investigator Initiated Studies Program. YF is supported by grants from the Japan Society for the Promotion of Science (Grant-in-Aid for Scientific Research [C] number 23591291), Japan Diabetes Foundation (Incretin Research) and Insulin Research Foundation (Novo Nordisk Pharma, Japan). YF also received scholarships from Eli Lilly, Pfizer and MSD. TY, YF, Y Takeda, JH, KKA, Y Takiyama, AA, YM, TJK and MH contributed to the study concept and design. TJK produced the HEK293 cell lines co-transfected with human forms of GIPR or glucagon receptor, and a cyclic AMP-inducible luciferase expression construct. TY, YF, Y Takeda and KKA acquired the data. TY, YF, Y Takeda, JH, KKA, Y Takiyama, AA, YM, and MH analysed and interpreted the data. TY and YF drafted the manuscript. TY, YF, Y Takeda, KKA, JH, Y Takiyama, AA, YM, TJK and MH reviewed the manuscript for important intellectual content. All authors have approved the final version of this manuscript. YF and MH are the guarantors of this work.